Sewing has happened this week, and no fabric buying! I did have to order a new roll of batting, but that just helps use the fabric. 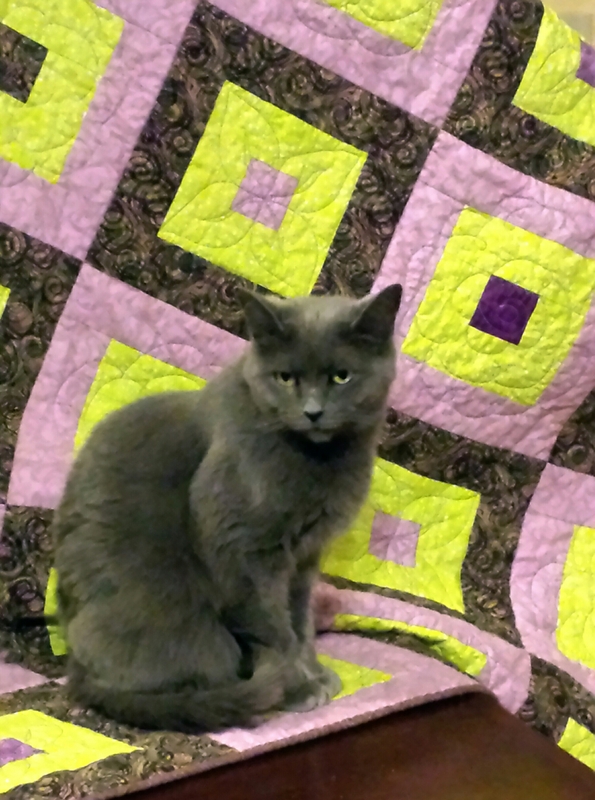 I used two yards for a customer’s wall hanging, and seven and a half for another purple and green quilt, this time for donation (Krissi is modeling it). If you missed the post on Spring Violets, it’s here. I can so do this! You can, too! Purple and green look great together. I love how you stitched the centers of your Spring Violets quilt. Yay, you’ll be breaking 100 net used in no time, great job, Valerie! Your donation quilt is pretty. I’m partial to purple and green. Great usage numbers for the year too. You’ve done really well on the stash busting. Spring Violets is gorgeous. You picked a great name for that quilt. Krissi is a great model!